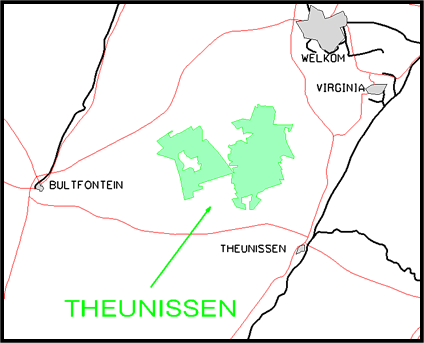 The Theunissen coal field is located in the districts of Theunissen and Bultfontein to the south-west of the Orange Free State Goldfields. The location of this coalfield is shown relative to towns, main roads and railway lines in Figure 1. The northern boundary of this coalfield is situated only some 12 km to the south of the city of Welkom. Prospecting for coal commenced early during 1900 over an area greater than 100 000 hectares in size and until the end of October 1981, 240 coal exploration boreholes were completed by Trans-Natal. The vast majority of minable coal is contained in the No.3 Seam, but the No.4 Seam also has adequate thickness and Calorific Value (energy) qualities to satisfy the requirements of a modern UCG power station. The minable reserve calculated for both the east and west areas, covers an area of more than 23,500 hectares. Exploration drilling continued unabated and the required drilling density of one borehole per 100 hectare was attained by the end of February 2000. The distribution of the No. 3 and No. 4 coal seam thicknesses and coal properties have been determined from the borehole information by taking into account the sedimentological and structural conditions that prevailed during the time of coal deposition as well as the structural and coal quality changes caused by dolerite intrusions. 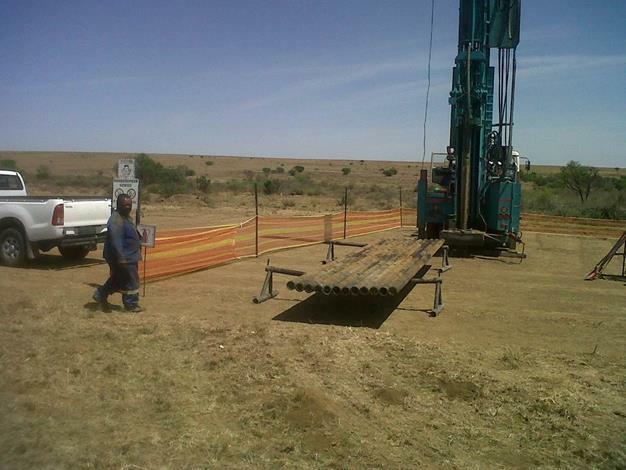 Africary has embarked on an exploration program to minimize uncertainty in geologic mapping, and commercial production and will drill 9 boreholes on the site selected for the first UCG panel on the farm Palmietkuil. This mining block of approximately 50 ha will be drilled to the spacing required by SAMREC and therefore Africary has added about 3.7 Mt of Measured coal into its resource base. 3.7 Mt of coal represents more than a decade of coal supply for a 50MWe power station. The exploration was completed as part of the Bankable Feasibility Study. All above coal characteristics are applied in a matrix structure to determine the optimum gasification conditions of this resource. · Positions of drill holes, including collar coordinates, hole depth, hole type and down-hole survey data where present. · Coal quality data including proximate analyses, sulphur, moisture and relative density. · Geology data, which gives distance, depth and the rock type present for each logged unit in the drill hole.